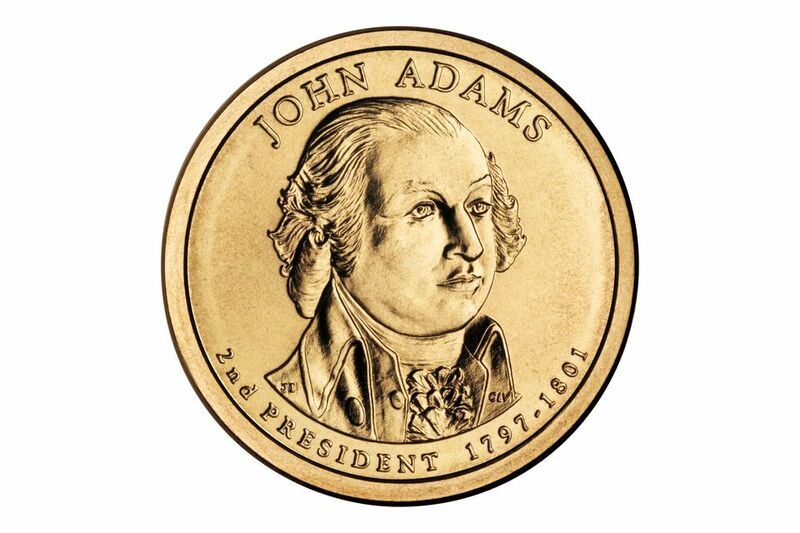 The John Adams Presidential One Dollar coin is the second coin in the Presidential Dollar coin series. The John Adams Dollar's official release date was May 17, 2007, but the coins were widely available ahead of time when banks neglected to stick to the official release schedule. U.S. Mint Artistic Infusion Program Master Designer, Joel Iskowitz designed the obverse of the John Adams dollar and sculpted by U.S. Mint sculptor-engraver Charles Vickers. The reverse of the Adams dollar depicts the Statue of Liberty, designed and sculpted by U.S. Mint Sculptor-Engraver, Don Everhart. The Statue of Liberty reverse is the same as the one used for the Washington Presidential Dollar and will remain in use throughout the entire Presidential Dollar series. The Presidential One Dollar coins have a diameter of 26.5 mm in ways 8.07 grams. The coin is composed of an alloy of copper, zinc, manganese, and nickel clad to a core of pure copper. The date, mint mark, and the motto In God We Trust is on the edge of the coin. The United States Mint produced coins for circulation at the Philadelphia and Denver mint facilities. The mint produced Proof coins at the San Francisco mint facility. Like the Washington Presidential Dollar the edge of the Adams coins is inscribed with the date, mint mark, IN GOD WE TRUST, and E PLURIBUS UNUM. The John Adams Dollar has a companion coin in the First Spouse gold coin series, minted in solid 24k gold bullion to honor Abigail Adams. John Adams was elected to serve as the second President of the United States, a term which he served in full from 1797 to 1801. Adams was no stranger to leadership roles in the nascent U.S. republic, having served as George Washington's Vice President for two terms, and a U.S. Senator from Massachusetts to the Continental Congress before that. Adams was on the committee which drafted the American Declaration of Independence and was influential in its preparation. Major foreign policy events marked John Adams' term as President. France and England were at war, and Adams faced the difficult reality of needing to protect and further America's interests while avoiding entering the hostilities between France and England. It didn't help when France's relatively unstable Revolutionary government refused to acknowledge the diplomats that Adams sent. America was unable to further its interests in Europe when the sea trading routes were rife with combatants and privateers, so Adams ultimately decided to build up the U.S. Navy and clear the sea routes himself. The young nation of America had few friends, and with France hinting at war with the United States, President Adams was forced to sign into law some drastic measures during his term, some of which are known as the Alien and Sedition Acts of 1798. These Acts made it a crime to publicly criticize the government, and were directed at domestic opponents which amounted to the Republican Party at the time, and were intended to crush opposition to the Adams Administration's foreign policies. These Acts included measures that discouraged immigration to the U.S. since immigrants supported Republican Party views. John Adams Was a Pompous Man and Nicknamed "His Rotundity"
John Adams was not known for being humble. In fact, he was contentious, vain, and frequently holier-than-thou, given to lecturing Congress on arcane matters of policy and procedure. When Congress was debating the proper title and form of address for the soon to be elected first President, Adams wanted the U.S. President to be addressed as "Your Majesty, the President," or "His High Mightiness." Sentiments such as this were very unpopular with America's Founding Fathers, and earned the moderately overweight Adams the nickname, "His Rotundity." During John Adams' tenure as Vice President, he chafed at the bit, yearning for more power and influence. He wrote to his wife, Abigail, "My country has in its wisdom contrived for me the most insignificant office that ever the invention of man contrived or his imagination conceived." It would be remiss to interpret these remarks, and the force of desire which drove them, as a negative aspect of John Adams' personality. It was for these reasons that Adams was elected President, despite never actively campaigning at all for the office. In fact, following his party's nomination, Adams retired to his Massachusetts farm, claiming he wanted nothing to do with the "silly and wicked game" of electioneering. By a slim electoral margin of 71 votes to 68 over Thomas Jefferson, who became his Vice President, Adams was elected and became the second president of the United States. Born October 30, 1735, in Braintree, (near Quincy,) Mass. Died July 4, 1826, also in Braintree, Mass., at the age of 90. Served as first Vice President of the United States under George Washington, from 1789 to 1797. Second President of the U.S., served one term from 1797 to 1801, with Thomas Jefferson as his Vice President. Married Abigail Smith in 1764, and fathered 5 children, including future President John Quincy Adams. First President to live in the White House. Why Are There Only Dead Presidents on Our Coins? Will This be the Most Valuable Uncirculated Kennedy Half-Dollar? Why Is This Sacajawea Dollar Worth Thousands of Dollars? Is The 2009 Lincoln Silver Dollar Coin Worth It?